The Omni Berkshire Place is located on 52nd and Madison Avenue in the heart of exclusive Midtown Manhattan. This 4 Diamond luxury hotel is just steps from exclusive 5th Avenue shopping and 1 block from St. Patricks Cathedral as well as 2 blocks to Rockefeller Plaza and Radio City Music Hall and 8 blocks from Central Park. It features 398 rooms and suites that are all non smoking with a fresh contemporary look. Rooms feature a 37 inch LCD HDTV as well as an English Sycamore Feature Wall with ample work space and mahogany furnishings plus luxurious linens. 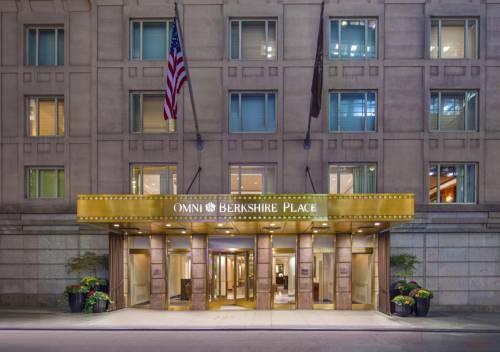 The Omni Berkshire Place currently resides on the prestigious Travel and Leisure Top 500 Worlds Best Hotels list and blends memorable elegance with the excitement of Midtown Manhattan. Hotel is 100 percent smoke free. At the intersection of 52 Street and Madison Avenue the Omni Berkshire Place is located in the heart of mid-town Manhattan. The hotel is just steps away from Rockefeller Center and Radio City Music Hall, Central Park, the Broadway Theatre district and Fifth Avenue shopping. Grand Central Terminal is 7 blocks from the hotel. The hotel location puts all of Manhattans businesses, restaurants and sporting venues within easy reach. All reservations must be cancelled before 12 noon local hotel time 1 day prior to arrival to avoid a cancellation charge. Individual rate plans may have cancellation requirements that vary from the standard policy. Check specific rate description for complete details. Bobs Steak and Chop House is a traditional American Prime Steakhouse that has been recognized for its lively atmosphere, big drinks, fine wines and large cuts of the finest prime steaks, chops, and seafood. - NYU - New York Univ. - World Trade Center Memor. No free shuttle transportation from property to city center. City center is within walking distance to property. Nearest subway is 2 blocks away. E or F Train at 53RD and 5TH Ave. The Port Authority bus terminal is located 1 mile away at 42nd Street and 8th Avenue. A taxi from there to the hotel is 15.00USD.